The marigold garland nearly knocks Sardar Sartaj Singh's narrow pagdi off his head. Unfazed, the 58-year-old politician nudges it into position, tips his head for another garland and sees his pagdi shift again. The safari suit, red tilak sporting Sartaj Singh is Hoshangabad's old warhorse. A constituency which his own party workers confess has been receiving much attention after Arjun Singh entered the electoral fray. 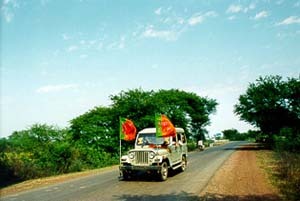 Although Sartaj Singh has won the seat thrice in a row from 1989 onwards, Hoshangabad was just another of Madhya Pradesh's 40 constituencies till the former Congress chief minister arrived as his rival. Until now, Sartaj Singh has been lying low as an MP restricted to his constituency -- distributing 3,500 cricket sets in 1,800 villages, apart from hand pumps, boundary walls etc from his MP's constituency fund. The pug nosed Sikh is blasé about all this attention. "You see for yourself what my support is like. My people won't let me down. 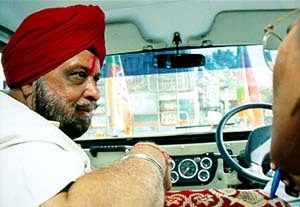 Arjun Singh will lose," says the mild mannered MP as he waves to a passerby who has stopped to take a closer look at him. "Arjun Singh may have the money, but our Sartajbhai has bahubal (might)," adds an enthusiastic supporter with a furious nod of the head. As Sartaj Singh takes on his toughest rival yet, he is on a hectic campaign schedule. Just back from Delhi at 0300 hours and plagued with a soar throat, he leaves his modestly done up home in Itarsi six hours later. With a former MLA as his guide and a handful of party workers, he has as many as 25 villages to cover in a day. The Mahindra Armada jeep bumps through kuccha-pukka village roads, through a permanent tunnel of dust. The candidate hops off often to meet stray passers-by. "In their garlands are their sentiments," he said hanging one of them on his rear view mirror. "How many villages remain?" he asks. "Twelve more," replies the enthusiastic former legislator. "Sir, we have to visit all. They are all waiting for us." Taking heed, Sartaj Singh braces himself for yet another long journey. Helping him in his fight with the Raja of Churhat are his wife, two of his three daughters married in Bhopal and Ujjain and his brother-in-law, Ricky from Delhi. "His wife goes with the lady party workers within the city," says Ricky who last visited Itarsi when Sartaj Singh was campaigning in the 1996 election. Compared to the banners, hoardings and several raths canvassing votes for Arjun Singh, Sartaj Singh's is a mellower presence in the constituency. His home in the centre of Itarsi, 11 km from Hoshangabad, wears a sombre look, devoid of any banners or posters, indeed of any poll paraphernalia. "One reason for this could be because Sartajji's business is almost finished. He is known to be an honest man, and no one is giving him funds," reveals one Itarsi resident. Once a businessman dealing in wood and charcoal, family members reveal that his interest in business dwindled after his entry into active politics. "All politicians make money after they get elected, but the 5 trucks that Sartajji once owned have been sold," discloses one BJP worker. Sartaj Singh and his supporters are confident that since he is a local and accessible to the electorate, this election will see him through to Parliament again. Of an electorate of approximately 1.2 million voters, Sartaj Singh expects to exceed the 47.58% votes he had received last time. Despite the Congress titan's presence, he hopes to cash in on the absence of a Bahujan Samaj Party candidate in the fray, the outcome of an informal understanding between Arjun Singh and BSP chief Kanshi Ram. Sartaj Singh says he is hopeful of getting 50% of the 80,000-odd tribal population in the constituency. The BJP also hopes to win 50% of the 100,000 Muslims in Hoshangabad. "Of course, their vote will not be for our party, but our candidate," a BJP worker says candidly. Although born in MP, Sartaj Singh moved to Itarsi from his original home in Rawalpindi after Partition. He had to take early responsibility of his family after his father died suddenly. "Since he bore the responsibility of getting his sister and three daughters married, Sartajji often says that fighting an election needs the same mental and financial preparation as a wedding ceremony," adds brother-in-law Ricky, a businessman himself. An old associate of the Rashtriya Swayamsevak Sangh, after a stint at the Mahapalika, Sartaj Singh first stood for an MLA's seat in 1984. He lost, but considers that defeat his biggest victory. "There was such an anti-Sikh wave, but I just lost by 1,000 votes," he says. 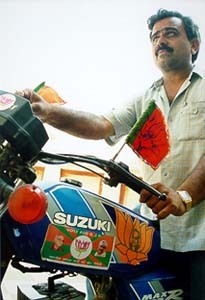 His first big win come in 1989 when he defeated Rameshwar Neekhra of the Congress. Neekhra, who remained his rival for three elections, is apparently sulking in Delhi on being denied a ticket from his old constituency. This time, one BJP activist tells us, the 20,000 to 25,000-strong party cadres in the district are charged up as never before "Arjun Singh's presence has put more energy into us. We have to work harder," they say. Though they swear that Sonia Gandhi's entry has not made any difference, their ruffled feathers can hardly be hidden. One of them urges Sartaj Singh to urge voluble BJP general secretary Sushma Swaraj to visit Hoshangabad. ''Soniaji was here the other day, if Sushmaji comes, it will appeal to the women," they tell the candidate. Sartaj Singh's next stop is Kolla Khari -- the 13th village on his itinerary. His speech begins... " Seventy per cent of the nation depends on agriculture. Whoever works for farmers will rule this country, not those who open fire at unarmed farmers." The crowd rises to a thunderous response. The reference is to the Multai firing in neighbouring Betul district where the police shot dead 17 agitating farmers on January 12; Madhya Pradesh, of course, is ruled by the Congress party. 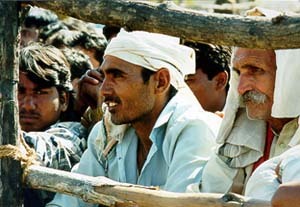 The candidate had struck a chord with the village of soyabean farmers. 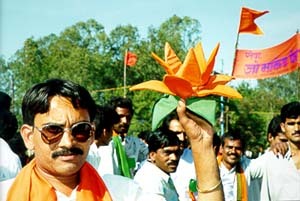 Ten former Congress workers who had switched allegiance to the BJP were the next attraction. As they were formally introduced over a faulty microphone, this time the party workers thundered. While Sartaj Singh bent to touch the feet of the village's 'Piyaribaba', the microphone was grabbed by a young enthusiast who sang a poem by Vajpayee. However, Kamalabai and Radhabai chose to stay away. 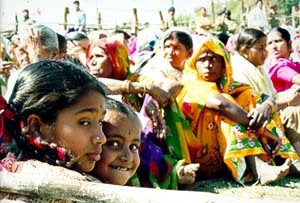 So did most of the women in the few villages we visited. "This time we will give the lotus a try. At least Sartaj Singh came to our village. Arjun Singh said he would, but didn't. We had spent so much money for his welcome," grumbled Radhabai. There are others who grumble too. "Arjun Singh hardly steps out of his car to accept our garlands," says a man from the neighbouring Nahakola village. Sartaj Singh is gracious about his rival and explains that Arjun Singh often gets restricted because of his 'Z' category security cover, a legacy of the Congressman's brief tenure as Punjab's governor in 1985. "After all, my name is also Arjun Singh."